Due to another transitional change in our lives, I’ve been doing more with my direct sales business. More, as in, shows/events every weekend I can find one. Most weekends, I fair well, making back the booth fee and grocery money for the week. Last weekend, I took my first loss. It was an outdoor event in 100 degree west Texas, complete with wind gusts that knocked down my table display. It was a first annual festival with live (very LOUD) music. I left the event hot, with a headache, and a very bad attitude. The disappointment lasted days. I let the lack of sales (money) take over and cloud my vision. Not pretty, fluffy white clouds or beautifully ominous storm clouds, but thick frozen fog type clouds. Until Thursday. Thursday I went to the apartment office to pay rent. Our property manager also happens to be a Lilla Rose customer. She asked about specials because she missed a recent online sale. I happened to have the patriotic hair accessories from my order in my bag. She bought one! Then that evening, I sent Dietrich upstairs to find one thing in a specific location. Instead, being an eight-year-old boy, he was looking in other locations and found a mini daisy flexi that Madilynn stole (and lost) MONTHS ago! It was a silly thing, but it turned everything around for me. I felt like the woman in the parable of the lost coin – rejoice with me for this small item that was lost is now found! Then Friday evening, a friend I haven’t heard from in a while contacted me about my hair biz! Alone, each of these things may not have been too inspiring, but together, I took it as a new motivation. From then I refocused my attention on my “why” – Lilla Rose wasn’t supposed to be the only income, even though it is right now. I joined the company to have “extra” in order to bless others. I joined because I found a hair accessory that works and doesn’t cause pain AND looks pretty. I joined because I love people and I love sharing solutions. This weekend, I did another event, semi-outdoors, without blaring music and with plenty of opportunity to talk to the customers and the other vendors. 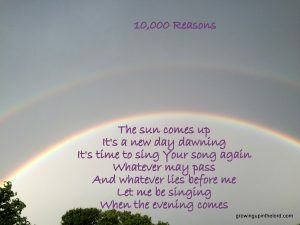 I woke before the alarm and experienced only a slight delay when Madilynn woke wanting me to “stay here forever.” I listened to some Praise and Harmony and as I pulled onto the main street in town, I saw a beautiful rainbow! (“10,000 Reasons” was playing at that moment). As I continued the drive, I saw three more! None of them were full rainbows, but each had the smaller, lighter reflected rainbow also. I marveled at how we are also a faded reflection of our Creator. I watched the rainbows fade. 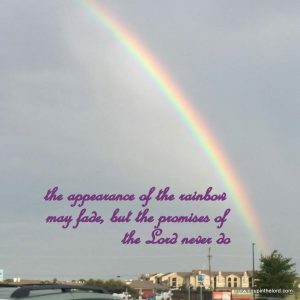 I basked in the knowledge that though the appearance of the rainbow may fade, but the promises of the Lord never do. Somewhere in the course of the day, I realized that is the real reason I walked away from the last event so depleted. Connection is much more difficult if you have to yell at your customers about your product. Communication at that level of distraction is so much more challenging. 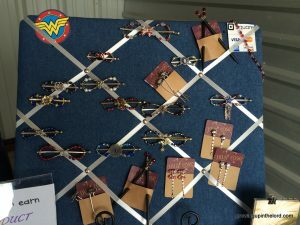 I listened to the vendor next to me as she shared some of her story, her present struggles, and the past she’s overcome. I had the ability to connect with each customer, whether they purchased from me or not. What do hair accessories and rainbows really have to do with my point? Small things can change your perspective. God doesn’t always answer our prayers in a big obvious way. Remember that He revealed Himself to Elisha in a whisper. When we pray, we must also be available to hear or see God at work. God’s small reminders gave me the strength to rely on His promises, rather than my own abilities. My joy is not dependent on sales, but on living in faith that God always keeps His promises. The rainbow promises that God will never destroy the entire earth by flood again. This one symbol represents all the other promises that God keeps when we remain faithful to Him. Nice thoughts. Glad to hear that you’ve found something fulfilling in Lilla Rose! Thank you! Who knew that vendor events are the perfect place for extroverts who like to talk and share stories?